Historian Bill Lebovich at 2016 Obscura Day tour of the Stones. 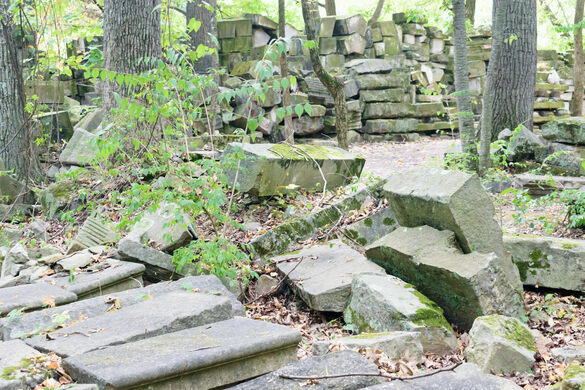 If you live in Washington long enough, someone will tell you a ridiculous-sounding story about a secret place in Rock Creek Park where there are huge piles of historic stone torn off the Capitol and abandoned. 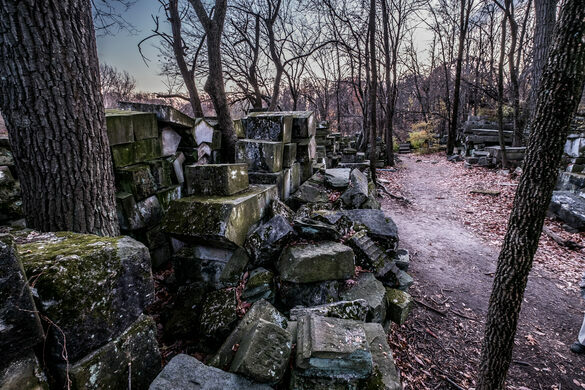 The Capitol Stones are an urban legend, but a legend that’s absolutely true. During a 1958 renovation of the Capitol, the Architect of the Capitol removed hundreds of sandstone and marble blocks from the building, some featureless slabs and some ornate carved pieces, most dating from the building’s original construction. 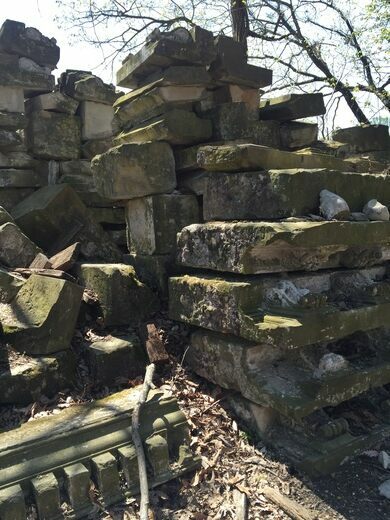 Not quite sure where to put this historic stone (the law barred selling or disposing of it), the builders quietly piled the stones behind a maintenance shed in Rock Creek Park, and abandoned them. 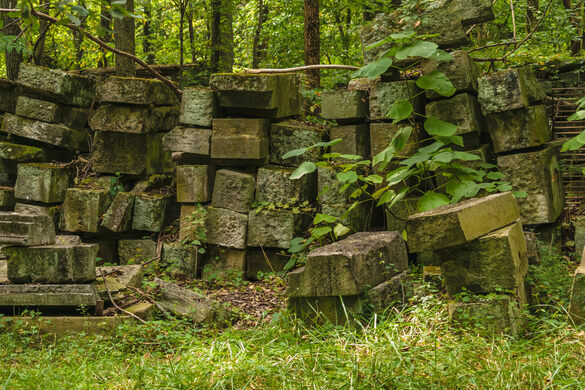 The stones, now mossy and in deep woods, feel more like an ancient architectural ruin than a dump site. The piles, some 20 feet tall, form almost orderly rows. 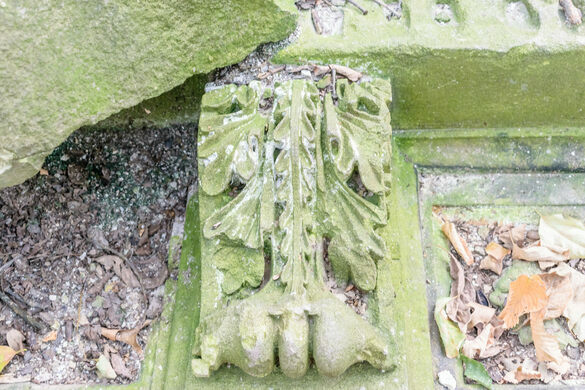 Every few feet you’ll see something unusual—a cornice poking out, a builder’s mark, a striking stone carving. 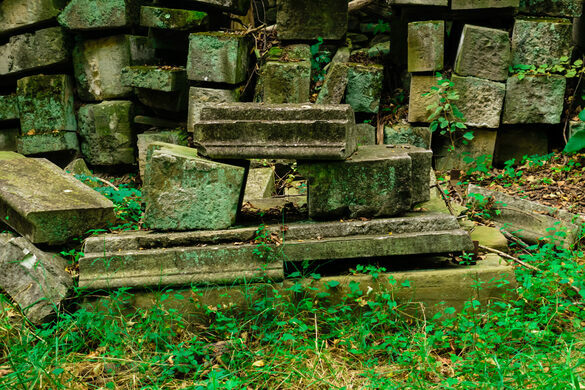 The abandoned stones are an entirely unofficial monument. According to a 2015 story in Washingtonian magazine, neither the Architect of the Capitol nor the National Park Service maintains the site. The government neither discourages nor encourages visitors. The path to the stones is unmarked, but well maintained. If you do go, be careful walking around, and be gentle on the stones. 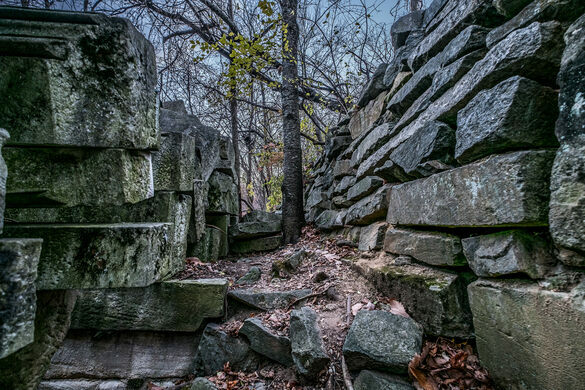 The Stones are 200 yards down an unmarked trail that runs southeast from the Rock Creek Stables. The remains of a large iron mill that once stood in the remote woods of northern Maine.